Well, it’s safe to say Natalie’s (Torrey DeVitto) wedding dress (and day) was ruined in the CHICAGO MED fall finale. Though Will (Nick Gehlfuss) quickly went M.I.A. on their wedding day—thanks to Ray Burke’s (Dennis Cockrum) sons kidnapping the groom—Natalie stalled the traditional activities in the hopes her fiance would make it on time. Alas, with his cover blown, Will nearly lost his life helping Jay (Jesse Lee Soffer) and the feds…but an injured informant was able to lead the authorities to the doc just in time. But things weren’t that simple for the star-crossed duo. Though a bloody Will was able to reunite with Natalie, it was only to tell her he loved her and he’d explain soon…before he was rushed to witness protection. Will and Natalie left things on a majorly dramatic note. When the show returns in 2019, will it be picking up immediately after we saw him being taken to witness protection or will some time have passed? Diane Frolov: We will have at least a two-month time jump, because he has been in protective custody. So he and Natalie have had no communication in that time. How are they adjusting to their time apart? Andrew Schneider: It’s very difficult. Frolov: That will be a big part of the second half. Schneider: How their relationship progresses. Frolov: And has been impacted by everything that happened in the first half. Are they still engaged in their mind? Frolov: As they first come together, they do consider themselves engaged. They do want to resume where they left off. Schneider: But things get in the way. Frolov: And the past gets in the way. While Will was away, Natalie will have to live in the aftermath of him being in witness protection and the botched wedding. How is she holding up and how are people treating her given they at least know she didn’t get married? Schneider: We don’t see it [on-screen] because of the jump, but we understand how difficult it’s been for Natalie. Frolov: And [her colleagues are] aware. Is she leaning on anyone in particular? Schneider: They’re best friends, so she leans on Maggie particularly at this time and dealing with this relationship. Is Will’s time in witness protection jeopardizing his job at the hospital? Schneider: The FBI considers him a hero. Frolov: He helped put all these people away! Schneider: But he’s going to have some emotional issues to deal with when we return. Frolov: It was very traumatic for Will, what happened in the fall finale. How will this impact the Halstead brothers’ relationship relationship going forward? Frolov: We see Jay again. We see Will struggling with the aftermath of it. We see the brothers dealing with it. Schneider: But most of the fallout involves Natalie—and Goodwin and Charles. April (Yaya DaCosta) and Ethan (Brian Tee) seem to take a step closer and then a step back. After dealing with the heartbreaking loss of their young patient—whose parents abandoned her—where do they stand? Schneider: He’s torn between Vicki and April. Frolov: And that we take forward in the second half of the season. We continue to play that forward until that comes to a head. Earlier in the season, Ava (Norma Kuhling) met with Connor’s (Colin Donnell) father to help secure the funds for the hybrid OR. She told her new boyfriend a little of what happened, but should viewers trust she’s told the whole story? Frolov: Down the line, it will come back. Schneider: Cornelius comes back to the show. Schneider: Perspective on that night than Ava gave us. Gwen (Heather Headley), the COO, has occasionally made life for the doctors difficult. How will she be playing into things in 2019? Schneider: Her main ally is Dr. Lanik in the ED. She has the full support of the board in trying to improve the bottom line. It’s mostly how it impacts her relationship with Goodwin. Goodwin is trying to balance the bottom line with patient care, where Gwen is just about the bottom line. What familiar faces can fans expect in the new year? Frolov: Emily is coming back, and bringing more problems for Ethan and April. Schneider: [Mekia Cox’s] Robin is coming back, Charles’ daughter. We’ll see Dr. Latham—he never left the hospital, but he’ll reappear in the show. Frolov: And we’ll continue to see Vicki. And we’re bringing on Ian Harding as a recurring character. How will the doctors be getting along with Ian’s character? Schneider: His baby girl is Natalie’s patient. The baby needs long-term care, so he’ll be around for a while. Will he be having sparks with someone, perhaps? Schneider: And certainly Will notices this guy and wonders [what’s going on]. Given the Will storyline in the early part of the season, there were a lot of mini-crossovers with P.D. But we’ve also seen small moments with FIRE and other P.D. characters popping up on MED. How will the universe continue to collide in upcoming episodes? Frolov: We love doing that! Schneider: In episode 10, [P.D.’s] Burgess appears. In 12, a lot of the FIRE characters appear. But we don’t have a three-way crossover in the works for the back half, yet. 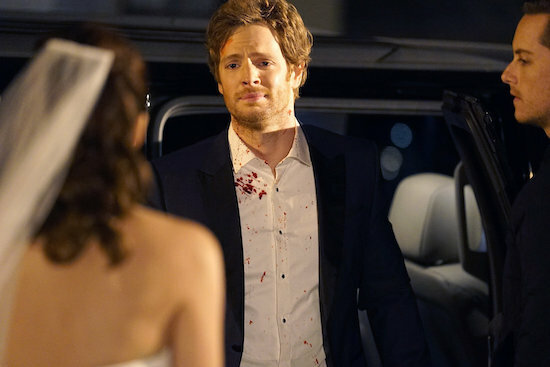 Obviously, this wasn’t a perfect wedding day for Will and Natalie. But before the season ends, will there be another attempt at a wedding for any of the characters? Schneider: There will be a wedding by the end of the season! ONE CHICAGO: NBC Orders More CHICAGO MED, CHICAGO FIRE, and CHICAGO P.D.